Today’s history lesson will focus on the Giants of the 1940’s. 1940: The Giants lose their grip on the Eastern Division and struggle with mediocrity on the way to a third place 6-4-1 season. 1941: On December 7th the Giants played their cross-town rival Brooklyn Dodgers for pride. Even though the Giants had lost their earlier match-up in Brooklyn, the 8-2 Giants had the Eastern Division Title sewn up. However, the game in which the Giants lost 21-7 would quickly fade into memory, as the sounds of football collisions were interrupted for the paging of Military Personal over the Polo Grounds Public Address system. Pearl Harbor had been attacked, and the country was now in World War II. With the specter of war weighing heavily there was talk of canceling the NFL Championship Game. However, the game would go on as scheduled two weeks later and the Giants would quickly grab a 6-3 1st Quarter lead over the powerful Bears in Chicago. However the Bears would take a halftime lead on a pair of field goals, and would go on to rout the Giants for a 37-9 final, with fourTouchdowns in the second half. 1942: A midseason three game losing streak dooms the Giants chances for getting back into the NFL Championship, as the men in blue fall to third place with a 5-5-1 record. 1943: The Giants get off to a rocky 2-3-1 start, as hopes for an Eastern Division Championship fades. However the Giants win their next two games and sit a 4-3-1 with two games against the first place Washington Redskins. If The Giants were to beat the Redskins in both games, they would be set up with a third straight match-up in the Eastern Division Playoffs. The Giants would win on December 5th in the Polo Grounds 14-10 and then again in Washington a week later 31-7 to set up the Divisional showdown in the Polo Grounds. However, third time was not a charm as the Redskins blanked the Giants to advance to the NFL Championship. 1944: The Giants led by a strong defense that only allows 76 points in an 8-1-1 season edge out the Philadelphia Eagles for the Eastern Division Title. 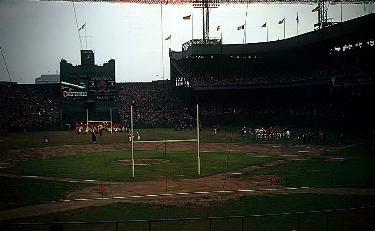 The Giants would face the Green Bay Packers in the NFL Championship Game played at the Polo Grounds. The Giants would have a rough time getting in the end zone all day as eth Packers raced out to a 14-0 halftime lead. The Giants would final crack the scoreboard on the first play of the 4th Quarter to get within a Touchdown. However, it would be the final scoring of the day as the Packers claimed the NFL Title with a 14-7 victory. 1945: With the victorious end of World War II, life began to return to normal in America, and the NFL, who got many of its stars back. However, up and coming Al Blozis who departed the Giants early in the 1944 season would not return. Blozis would lose his life in battle, and the Giants would retire his uniform number 32 in his honor. 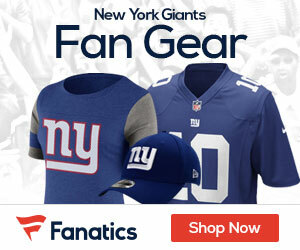 The Giants would also experience rough times on the field as they suffer through a disappointing 3-6-1 season. 1946: The Giants rebound nicely off their poor 1945 showing and reclaim the Eastern Division title with a 7-3-1 record. However, the Giants could not contain the Chicago Bears and Quarterback Sid Luckman who was a one-man wrecking crew in the Bears 24-7 win over the Giants at the Polo Grounds. 1947: The Giants never quite get started, and struggle from the very beginning of the season. The defending Eastern Division Champions would not even win their first game until November 30th, by then the Giants were settled in last place having started the season 0-7-2. The Giants would go on to split their last two games as the aging Giants finished with a 2-8-2 record. 1948: The Giants continue to struggle posting a record of 4-8 as the Giants defense allows a league high 388 points as they allowed 35 or more points seven times during the season including an embarrassing 63-35 home loss to the Chicago Cardinals and a 52-37 home loss to the Los Angeles Rams. 1949: After two straight eight loss seasons the Giants show some signs of life, and sit at 6-4 with two games remaining even though a Division Title is out of the question the Giants can get a measure of respect if they can beat the Philadelphia Eagles in any of the two games to close out the season. However, the Eagles prove to be too strong, and hold the Giants to a Field Goal in each game ending the Giants hopes for a winning season.